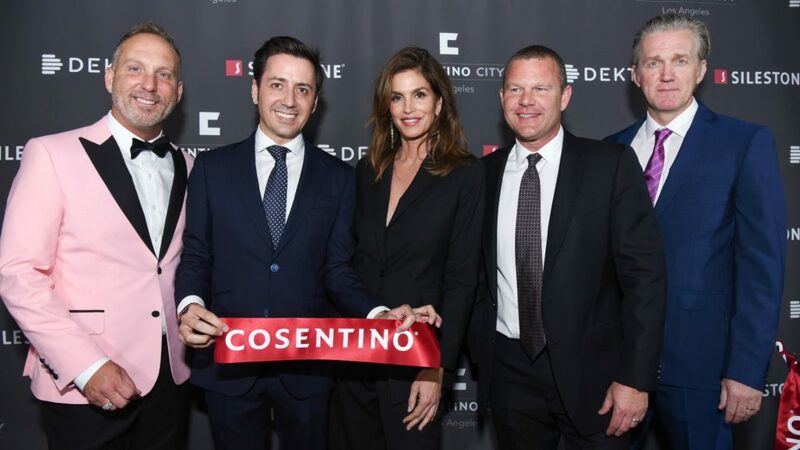 Fashion icon and brand ambassador for Silestone, Cindy Crawford attended the opening of the Cosentino City showroom in Los Angeles. The Cosentino City showroom, which represents an investment of $1.7billion, is the 12th in the world and the fourth in the United States. Measuring 400sqm, the indoor-outdoor space offers an immersive experience for design professionals and consumers in West Hollywood. It aims to provide an environment where designers and clients can discuss ideas, products and designs. The 328sqm indoor space features technology to create life-like renderings to see how Consentino materials will appear in residential and commercial settings. In addition, the 63sqm courtyard showcases the applications of Dekton in exterior applications. Around 300 people from LA’s architecture and design community gathered for the opening and to watch Cindy Crawford in conversation about design and fashion with editor of LALA Magazine Jessica Kantor. Cosentino has recently been named as one of best 50 companies to work for, according to Forbes.